Series of sites arranged around a junction. Currently the only signed service area on the A64, between York and the A1(M). The eastbound services are only accessible eastbound, while the westbound services are available (and signed) in both directions via a flyover. There is also a Land Rover dealer within the services. In early 2018, plans were submitted to redevelop the current forecourt shop by owners at the time MRH. The plan was refused in April 2018. The eastbound Little Chef opened in 1990, alongside the Travelodge and a petrol station. A Burger King was added and later closed. It was the second restaurant to be refurbished by Heston Blumenthal, copying the blue sky ceiling and wall of memorabilia. In 2012, a Little Chef Express was added and later, in 2014, the Burger King re-opened. The eastbound restaurant closed in January 2018 following the demise of Little Chef. It was replaced by Euro Garages own-branded EG Diner. The EG Diner and the Burger King both closed on 24 August 2018. 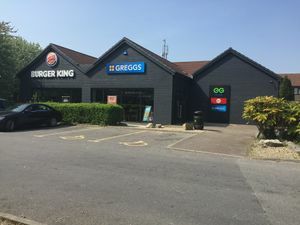 The Burger King reopened in November 2018 following refurbishment alongside a new Greggs store. The westbound restaurant was a Happy Eater, which became a Little Chef and closed in 2004. It then became Triton's Fish & Chips before Scott's Fish & Chips.